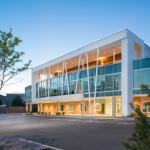 The Behavioral Analyst Certification Board (BACB) project is a new office building located in the Ken Caryl Business Park in the southwestern part of Metro Denver. The cutting-edge design is environmentally conscious and includes a 70KW solar system located on the roof and adjoining carport structures. 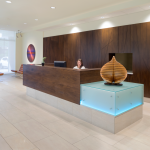 The building was constructed on a 2-acre site and stands on a spread footing and slab-on-grade foundation system. The main frame of the building is structural steel. The exterior walls are constructed of structural metal stud framing with a combination of copper siding, stucco, stone and storefront systems. Careful design considerations were used to ensure storefront systems could be used in lieu of curtainwall systems, providing substantial project savings. 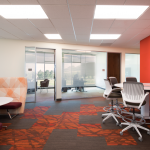 The first floor of BACB includes a fitness center, call center, main entry and reception area. 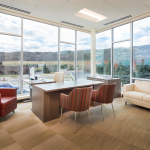 The second floor is dedicated to office space, including offices with full glass fronts. 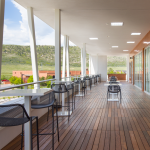 The third floor consists of a large training center with a NanaWall system opening onto a rooftop terrace with spectacular views of the Rocky Mountains.